Tom Segura at the Keller Auditorium! Women in Comedy Festival sponsored by HBO! I’m so excited to be performing at the Women in Comedy Festival this year, sponsored by HBO and taking place in Boston & Cambridge, MA. Three musicians vs. three poets vs. three comedians! - the audience picks the winners! Plus a featured performance and a raffle! The audience will choose the winner by applause. Winner receives a cash prize and a future headline spot at a future Nova Productions show. Additional raffle tickets can be purchased at the door! I’m stoked to open for my supremely talented friend JR DeGuzman (Netflix, Comedy Central) at Willamette University! 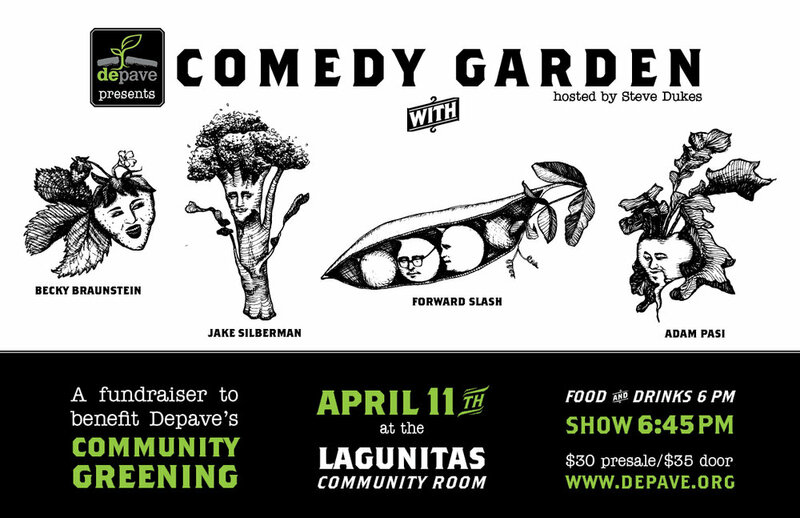 Enjoy a night of Comedy, Dinner and Drinks dedicated to Depave and all of its supporters. This prestigious event is to recognize all of Depave's transformative work and those who worked shoulder to shoulder to make our neighborhoods a little greener by removing one square of pavement at a time. Connect with friends and make new ones while trading Depave stories. While you're there, don't forget to stock up on Depave merchandise and participate in the raffle. We encourage you to act on your inspiration and raise your paddle in support of our upcoming projects. Ticket includes a seat at the show, dinner and one free drink token. Additional drink tokens will be available for purchase. Non-alcoholic beverages will be available for free. Ages 13+, since the comedy show may include adult themes not appropriate for youth. **Returning Fave Musical Guest: Jenny Conlee from The Decemberists! Introducing Laughing Together! A new monthly Stand-Up, Video & Variety Showcase, every second Sunday at The Waypost in Portland, OR, hosted and curated by Jay Shingle (High & Low Festival, The Hard Times Fortune Teller). The show will feature comedy performers from all disciplines, variety acts, video screenings from local filmmakers & content creators each month! I’m the standup guest on Late Night Special - tune in! Late Night Special is the weekend party where you always have an invitation - with sketches, live music, interviews, and acts you just can't see anywhere else! And, of course, the ringleaders of this whole show, Stacey Hallal (Irregardless, Joyride, Ruby Rocket) and Jay Flewelling (Work Shmerk, Please Underestimate Me). It's the only weekly Late Night Talk Show meets Variety show in Portland and promises to always be a good time! with Ian Karmel at Revolution Hall! I’m so honored and so stoked to do a set at Ian Karmel’s sold out show at Revolution Hall in Portland! I hope you got tickets in time because he’s a national treasure and there will be some other super special guests - it will be a hell of a time. The Pacific Northwest's most riotous comics come together to raise money for HRC with the SheBrew Festival. Killer jokes by the baddest women in PNW comedy, all for a great cause. Support the Human Rights Campaign and kick off the fun for SheBrew 2019! Becky with the Good Jokes returns to the Funhouse Lounge stage! Spectacular comedians. Good news. Prizes. Late night show - style video bits. A confetti finale. Runner-Up for Best Comedy Event in the Willamette Week's 'Best of Portland', Becky with the Good Jokes is a one-in-a-million comedy show / lovefest which cannot be described in words, you just have to experience it. Hosted by Portland favorite / Alaskan expat powerhouse comedian Becky Braunstein (EPIX, Teen Vogue, Audible), this Portland comedy essential features top comedians, a mix of nationally known and up & coming musical guests (past musical guests include Jenny Conlee from The Decemberists, The Unipiper, American Idol semifinalist Haley Johnsen, Hutch Harris from the Thermals & the Portland Gay Men's Chorus), good news, video bits, prizes and surprises - including drop-in sets from visiting headliners (past guests include Matt Braunger, Ian Karmel, Marcella Arguello & Becky Robinson, as well as video appearances by Pete Holmes, Jamie Lee, Gina Yashere & the mayor of Anchorage, Alaska). The regular live show happens monthly at the Funhouse Lounge in Portland, OR. Musical Guest: Jet Black Pearl! Brooklyn Bust Up is quickly becoming one of Portland’s great bar room shows. Always featuring Portland’s best comics with up and coming comics. Every 3rd Wednesday @ Bar 33 Brooklyn, 8-10 pm. Comedy is difficult. Moving to a new city even more so. These poor souls decided to do both and picked Portland, a city rightfully wary of outsiders. The fourth edition of Helium's Transplants showcase features some of the brightest comedic minds from across the country that have moved to Portland specifically in pursuit of furthering their comedy endeavors. Part of Portland's allure is the city's strong support of the arts community and comedy is no exception. They're not here to steal your apartment or open another coffee shop. They're simply here to prove their worth among the city's thriving comedy and arts scene. They are the Transplants. Featuring:Becky Braunstein, Corina Lucas, Isaac Pendergrass, Ben Rose, Chase Brockett, Jaren George, Zoe Proval, and Pedro Andrade! SINCERITY IS GROSS is the weekly Sunday comedy happy hour show at The Slide Inn! As always, the show is FREE! Doors open at 8pm, the showcase begins at 8:30pm. Becky with the Good Jokes returns to the Funhouse Lounge stage! Spectacular comedians. Good news. Prizes. Late night show - style video bits. A confetti finale. Runner-Up for Best Comedy Event in the Willamette Week's 'Best of Portland', Becky with the Good Jokes is a one-in-a-million comedy show / lovefest which cannot be described in words, you just have to experience it. Hosted by Portland favorite / Alaskan expat powerhouse comedian Becky Braunstein (EPIX, Teen Vogue, Audible), this Portland comedy essential features top comedians, a mix of nationally known and up & coming musical guests (past musical guests include Jenny Conlee from The Decemberists, The Unipiper, Hutch Harris from The Thermals & the Portland Gay Men's Chorus), good news, video bits, prizes and surprises - including drop-in sets from visiting headliners (past guests include Matt Braunger, Ian Karmel, Marcella Arguello & Becky Robinson, as well as video appearances by Pete Holmes, Jamie Lee, Gina Yashere & the mayor of Anchorage, Alaska). The regular live show happens monthly at the Funhouse Lounge in Portland, OR. Doors open at 9:30pm, show starts at 10pm. Tickets are $8 advance, $12 at the door. Hugs from Becky are free. Join us for another night of locally curated comedy at the Hawthorne Lounge on January 23rd at 7 pm! JFL Audition Show at Helium Comedy Club! This is super exciting & a great honor: I was invited to audition for Just for Laughs in Montreal, which is the biggest comedy festival in the world. Myself and a few other Portland comedians will each do our best 5 minutes for consideration by the festival bookers. You don’t want to miss this. AWESOME NEWS: I’m SO excited to be BACK performing at SF Sketchfest, the San Francisco Comedy Festival again in January! LOOK AT THIS LINEUP! BECKY WITH THE GOOD JOKES END OF THE YEAR SMASH SHOW! A Portland comedy essential, Becky with the Good Jokes is a one-in-a-million comedy show / lovefest which cannot be described in words, you just have to experience it. Hosted by lovable, affable, lunchable, Portland-via-Alaska comedian Becky Braunstein (Teen Vogue, EPIX, Bridgetown, Big Sky & Laughing Skull Comedy Festivals, Audible, Portland Mercury's 'Undisputable Geniuses of Comedy', Willamette Week's Funniest 5), and featuring top comedians, a mix of nationally known and up & coming musical guests (past musical guests include Jenny Conlee from The Decemberists, The Unipiper, American Idol semifinalist Haley Johnsen & the Portland Gay Men's Chorus), good news, video bits, prizes and surprises - including drop-in sets from visiting headliners (past guests include Matt Braunger, Ian Karmel, Shane Mauss, Derek Sheen & Becky Robinson), as well as video appearances by Pete Holmes, Jamie Lee, Gina Yashere & the mayor of Anchorage, Alaska. WE'RE DOING IT REAL BIG FOR DECEMBER, AND THE SUPER SPECIAL END OF THE YEAR SMASH SHOW WILL FEATURE A SPECTACULAR LINEUP - WHICH WILL BE ANNOUNCED SOON! One of the top comedy showcases in New York City, Fresh Out is a weekly standup show on Thursdays at 9pm, run out of UCBeast 153 East 3rd Street. Featuring the freshest comics available anywhere - from heavy hitters like past guests Zach Galifianakis, John Mulaney, Jim Gaffigan, David Cross, Mike Birbiglia, and Janeane Garofalo, to the best up-and-coming comics, we bring you the best! Funniest 5 at Revolution Hall! Monday nights at The Secret Society just got more eventful. We are introducing four new regular shows. Enjoy some local storytelling at Front Porch Sessions or Invisible Spectrum, listen to interviews; stand-up comedy and music at Live N Portland and come out to see Broke Gravy, one of the hottest improv trio’s in Portland! Help us celebrate all of the beautiful people that make up this city of ours. Discover all of the diverse voices and perspectives that Portland has to offer. Show up for the Turnout! My Special Premieres on EPIX! Tune in to watch my episode of Unprotected Sets, only on EPIX! You can get a 14-day free trial at www.epix.com. I’m so excited to see how it turns out! Comedy at Prairie Bar & Grill! 21+. Comedy Bender is a standup comedy/storytelling brunch show for people that have trouble getting out of bed because last night was a doozy, a pickle, or a kerfuffle. If you are those people then wipe the sleep out of your eyes and try to make it to The Lamp by noon on a Saturday. If you do, you'll see some of the best local and touring comedians do their thing then riff on anonymously submitted hangover stories from the audience. We’ll relive your pain, we’ll enshrine your mistakes, we’ll make fun of you and more at this wonderfully saucy comedy show that revels in debauchery and also Mediterranean style breakfast. Comedy Bender: Your hangover, our material. Join Brandie Posey (Lady to Lady Podcast, Comedy Central, All Jane Comedy Festival, Bridgetown) & friends for a night of stand up comedy you'll never forget. Brandie has been called a "Riot Grrl on Acid" and is a darling of LA's comedy scene, and for one night only she's bringing some pals to get Curious. DEAD COMICS SOCIETY is a FREE comedy show hosted by Chase Brockett every FIRST FRIDAY, 9PM at ROGUE ALES & SPIRITS in Portland, Oregon.